Custom Chevy and GMC subwoofer boxes allow you to easily add bass to your vehicle. 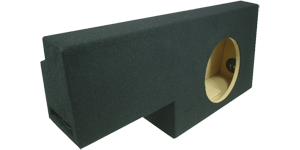 Since we have custom designed and are able to produce our subwoofer boxes we can offer them at great prices. We stock boxes for many popular models including the Chevy Silverado, Chevy Tahoe, Chevy Trailblazer, Chevy Camaro and Chevy C/K. We also have boxes for the GMC Sierra, GMC Canyon, GMC Sonoma, and Pontiac Firebird.